Voluntary sector chief executives have risen to the challenge of the government's big society agenda in a new document on the role of the third sector. The report argues that over the past few decades governments have tended to act as if improvements in public health could be left to the organised efforts of the state, the organised efforts of the NHS, or the organised efforts of the public health profession. 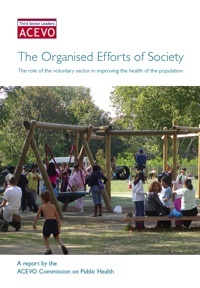 Now, the report argues, is the time to return to the fact that public health is dependent on 'the organised efforts of society'. Visit ACEVO site and download the full report.